تحلیل سیگنال های EEG نقش مهمی در زمینه های گسترده ای مانند بررسی داروهای روان پزشکی، مطالعه در زمینه خواب، ثبت و تشخیص صرع و تحلیل پدیده هیپنوتیزم بازی می کند. از سال ها پیش هیپنوتیزم به عنوان روشی موثر برای کمک به بیماران در زمینه های مختلف مانند کاهش اضطراب، ترک برخی عادات نادرست، کنترل درد و ... شناخته شده است. EEG حین هیپنوتیزم خالص و EEG در حالت نرمال و غیرهیپنوتیزم کاملا با یکدیگر تفاوت دارند. روش های مختلفی برای تحلیل سیگنال EEG وجود دارند و روش شاخص شباهت فازی یکی از روش های شناخته شده در این زمینه است. در این مقاله، ویژگی های سیگنال EEG نیم کره های چپ-راست و لوب قدامی- خلفی در حالت هیپنوتیزم (ویژگی های فرکتال، آنتروپی موجک، باندهای فرکانسی) که متعلق به سه گروه با هیپنوتیزم پذیری پائین، متوسط و بالا، بودند استخراج شده و با استفاده از روش شاخص شباهت فازی، مورد بررسی قرار گرفتند تا مشخص شود که آیا رابطه معناداری میان فعالیت این نیم کره ها در حالت هیپنوتیزم و درجه هیپنوتیزم پذیری افراد وجود دارد یا خیر. در نهایت پس از تائید وجود رابطه معنادار میان سیگنال های نواحی مختلف، با استفاده از ویژگی هایی که در مرحله قبل رابطه معناداری را نشان دادند، طبقه بندی این گروه ها انجام شد. در واقع از ویژگی هایی که در مرحله قبل پیش ایجاد تمایز میان گروه های مختلف هیپنوتیزم پذیری را نشان دادند به عنوان ویژگی های طبقه بندی کننده استفاده شد تا بر اساس آن بتوان افراد را به سه دسته با قابلیت هیپنوتیزم پذیری پائین، متوسط و بالا تقسیم کرد. بهترین نتیجه صحت طبقه بندی برابر با %94 (برای دو دسته ویژگی: 1. آنتروپی، هیگوچی، فرکانس بالا و 2. 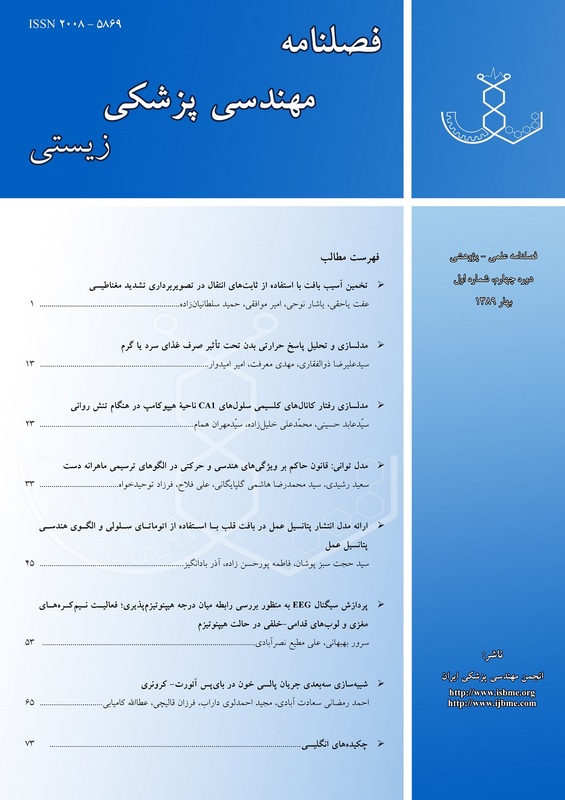 انرژی، آنتروپی) و کمترین میزان آن برابر با %87.5 (برای ویژگی های آنتروپی، هیگوچی و فرکانس پائین)، به دست آمده است. The analysis of EEG signals plays an important role in a wide range of applications, such as psychotropic drug research, sleep studies, seizure detection and hypnosis processing. From years ago hypnosis was known as a method to help the patients in different fields such as reduction of stress, leaving bad habits, pain control and etc. EEG signals during pure hypnosis would differ from those recorded in the normal no hypnotic conditions. There are several methods for analyzing the EEG signal and similarity index method is one of the famous methods in this branch. In this paper the features of EEG signal of three groups of people with different hypnotizability during hypnosis (Fractal, Wavelet Entropy, Frequency Bands) from left-right and frontal-back lobes were extracted and analyzed using Fuzzy Similarity Index Method to find whether there are any significant relations between the function of these hemispheres and hypnotizability degree. Finally after detecting the significancy, we used the selected features were used to classify the subjects into three groups of hypnotizability. The best classification accuracy was obtained 94% (for two classes of features 1. entropy, Higuchi, high frequency, 2. energy and entropy) and the lowest was 87.5% (for entropy, Higuchi and low frequency features). هربرت اشپیگل، گرین لیف مارسیا، اشپیگل دیوید، تحویل روان‌شناسی، ترجمه: علی شریفی، عنایت شهیدی، کامبیز عبقری، زیر چاپ. Bowers K. S., Waterloo-Stanford Group Scale of Hypnotic Susceptibility, Form C: Manual and Response Booklet, International Journal of Clinical Hypnosis, 1998; 3: 250-268. Ray W.J., Understanding Hypnosis and Hypnotic Susceptibility from a Psychophysiological Perspective, 5th Internet Word Congress for Biomedical Sciences, INABIS98, December 7-16 1998; available at: http://www.mcmaster.ca/inabis98. De Pascalisa V., Rayb W.J., Tranquilloa I., D’Amicoa D., EEG activity and heart rate during recall of emotional events in hypnosis: relationships with Hypnotizability and suggestibility, International Journal of Psychophysiology, 1998; 29: 255-275. Galbraith G.C., Electroencephalography and Hypnotic Suseptibility, Journal of Comparative and PhysiologicalPsychology, 1970; 72: 125-136. مطیع‌نصرآبادی علی، ارزیابی کیفی و کمی تغییرات هوشیاری و عمق هیپنوتیزم به کمک پردازش هوشمند سیگنال RRG، پایان‌نامه دکترا، دانشکده مهندسی پزشکی، دانشگاه صنعتی امیرکبیر، 1382. Apple P.R., Bleiberg J., Pain Reduction is Related to Hypnotizability but not to Relaxation or to Reduction in Suffering: A Preliminary Investigation, Psychology Service, National Rehabilitation Hospital, Washington, DC 20010, USA, 2006. PHD - Professional Hypnosis Databank – Maryland Family Hypnosis, Copyright (C) Alberto Torelli, 1996- 2011, http://family-hypnosis.com/docs/allPublication Hypnosis.pdf. Egner T., Jamieson G., Gruzelier J.H., Hypnosis decouples cognitive control from conflict monitoring processes of the frontal lobe, Neuroimage, 2005; 27: 969–978. Fingelkurts A.A., Kallio S., Revonsuo A., Hypnosis induces a changed composition of brain oscillations in EEG, Contemp. Hypnosis, 2007; 24(1): 3–18. Maiwald T., Winterhalder M., Aschenbrenner-Scheibe A., Voss H.U., Schulze-Bonhage A., Timmer J., Comparison of three nonlinear seizure prediction methods by means of the seizure prediction characteristic, Physica, 2004; D 194: 357–368. Li X. and Ouyang G., Nonlinear similarity analysis for epileptic seizures prediction, aCERCIA, School of Computer Science, Nonlinear Analysis,2006; 64 (15): 1666-1678. Li X., Yao X., Application of Fuzzy Similarity to Prediction of Epileptic Seizures Using EEG Signals, Springer-Verlag Berlin Heidelberg, LNAI 3613, 2005: 645 – 652. Tolias Y.A., Panas S.M., Tsoukalas L.H., Generalized fuzzy indices for similarity matching, Fuzzy Sets and Systems, 2201; 120 (2): 255-270. Lee-Kwang H., Song Y-S., Lee. K-M., Similarity measure between fuzzy sets and between elements, Fuzzy Sets and Systems, 1993; 62 (3): 291-293. Elif Derya Übeyli, Fuzzy Similarity Index for Discrimination of EEG Signals, EMBS Annual International Conference, New York City, USA, 2006, Aug 30-Sept 3. Guler I., Ubeyli E.D., Analysis of Doppler ultrasound signals based on fuzzy similarity index, Expert Systems with Applications, 2006; 31(1): 130-136. Lee J-S., Fractal Analysis of EEG in Hypnosis and its Relationship with Hypnotizability, Intl. Journal of Clinical and Experimental Hypnosis, 2007; 55(1): 14– 31. Gómez C., Mediavilla A., Hornero R., Abásolo D., Fernández A., Use of the Higuchi’s fractal dimension for the analysis of MEG recordings from Alzheimer’s disease patients, Med Eng Phys, Medical Engineering Physics, 2009; 31(3): 306-13. Epub 2008 Aug 3. Li X., Kapiris P.G., Polygiannakis J., Eftaxias K.A., Yao X., Fractal spectral analysis of pre-epileptic seizures phase: in terms of criticality. Journal of Neural Engineering, 2005; 2 (b): 6–11. Accardo A., Affinito M., Carrozzi M., Bouquet F., Use of fractal dimension for the analysis of electroencephalographic time series, Biol Cybern, 1997; 77: 339–50. Cvetkovic D., Übeyli E.D., Cosic I., Wavelet transform feature extraction from human PPG, ECG, and EEG signal responses to ELF PEMF exposures: A pilot study, Digital Signal Processing, 2008; 18 (5): 861-874. Adeli H., Zhou Z., Dadmehr N., Analysis of EEG records in an epileptic patient using wavelet transform, J. Neuroscience Methods, 2003; 123 (1): 69-87. Ouyang G., Li X., Li Y., Guan X., Application of wavelet-based similarity analysis to epileptic seizures prediction, Computers in Biology and Medicine, 2007; 37 (4): 430-437. صادقی علی، آشنایی با نرم‌افزار تجزیه و تحلیل SPSS، انتشارات جهاد دانشگاهی، 1385، 152-163. Xu W., Guan C., Siong C.E., Ranganatha S., Thulasidas M.and Wu J., High accuracy classification of EEG signal, Intl. Conference on Pattern Recognition, 2004: 391-394.